A gem in Sapphire Valley, just a short distance to Cashiers, a private escape, a place to rediscover your family bonds. A place where the outdoors is yours and the fresh mountain air refreshes your life. A view so majestic and lakes so inviting...... The Dogwood House ..... a former Model Home.... is your private retreat in this mountain paradise. This home sleeps 9 with all the comforts of home. Fully equipped new granite kitchen for your culinary delights, cozy linens provided, comfy living area, and great deck with mountain views & 4 flat screened TV's. Start the day gently rocking in the rocking chairs on the deck enjoying a morning hot cup of coffee and end the day cozy up to the fireplace in the winter or plunge into one of the clubhouse pools or the beautiful Sapphire Lake! Activities galore in the community will entertain you for the entire duration of your stay! The Dogwood House is more than just a house - it's home. Escape to the mountains -- The Dogwood House awaits your arrival. Special rates for long weekends! Located beyond the Guard Gate in the Estate Home section of Sapphire but walking distance to most all amenities which are included! Real Estate professional for over 39 years and have served my board and community in a volunteer position for over 20 years. Family is most important to me and we all enjoy our mountain time together and love the opportunity to be able to provide the mountain experience to all of my past customers and future guests. Love to enjoy the fresh and cool mountain air, many breathtaking views of waterfalls and all that nature has to offer plus so many amenities to enjoy with family and friends in the mountains. There is so much to enjoy, indoor and outdoor pools, spa, hot tub, fitness center, tennis, golf, boating, hiking, recreation center events, walking track, dog park, quaint small towns to visit nearby such as Cashiers, Highlands ,Brevard, Hendersonville and Asheville. There is a nominal fee for golf & boat rentals. Bathrooms come fully equipped with towels, bath mats, toilet paper, anti-bacterial liquid soap and shower gel for your convenience. Master bath has dual sinks and separate shower and heart-shaped tub. Downtown Cashiers is only 5 minutes down Route #64 - close to sopping center, Ingles food market, post office and much more. Located on the main campus of the resort tucked behind the Guard Gate, but within walking distance of all amenities. Also located in Sapphire Resort is 4 restaurants right on-site. The Village of Cashiers is located just 10 minutes down Route #64, a little further and only 20 minutes is Highlands - both have many shops and restaurants. There is no Golf Course view but many area courses located in and around Sapphire Resort. The view of the mountains can be seen from the large open deck in the fall and winter. In the summer, the trees obstruct most of the view. There are two central air-conditioning systems - one for the downstairs and one for the upstairs both controlled by wireless - Nest. There are two systems - one for the downstairs and one for the upstairs controlled by 2 wireless thermostats. All sheets and towels are provided for your convenience. Washing machine is available just off the guest bath. Dryer is available just off guest bath. Home has wireless internet for your convenience. Yes, all towels are provided for your convenience. There is a fitness facility on-site at the Recreational building within walking distance. The living room is actually a great room and can accommodate seating for up to 8-10 people. Leather couch & love seat plus leather chair & ottoman plus several rocking chairs. This Sansung refrigerator has an icemaker. The dining room table accommodates up to 10 as there is a matching bench in the master that can be used for additional seating. There are 4 TV's located in the home and are connected to satellite - movies can be accessed for your convenience, but the charge for each at $3.99 is deducted from the security deposit. Yes, there is one stereo available in the great room for your enjoyment. Yes, there is a DVD player. There are books available located in the Master bedroom and upstairs Queen bedroom nightstands. There is a game room on-site at the Recreational Center. There is an assortment of games for the entire family located in the Master bedroom walk-in closet. Yes, there is several pool tables available at the Recreational Center. Yes, there is a wide selection for children and adults. There is a gaming room on-site at the Recreational Center. There are all kinds of boats available for rental at the marina for guests. The Sapphire Lake marina and boat dock is available to all guests with ID. Rates for boat rentals are available at the dock area. Extra-large deck - beautiful distant view of the mountains in the fall & winter. Sapphire Lake as well as Lake Glenville close by have available gear for your water safety. This is available at the Sapphire Resort ski slope in the winter. They also have snow making equipment and several lifts. There are several tennis courts included and on-site loicated near the guard gate entrance. There are several golf courses available to the public within the area. There are only 5 steps up to the deck and main living area and 2 bedrooms on the first floor. Yes, there is a sauna available at the Recreational Center. There are 3 heated pools for the convenience of guests including an indoor pool and hot tub, sauna and steam rooms. Yes, at the Recreational center. Beautiful new granite kitchen, upgraded fixtures and beautiful hardwood floors, 4 TV's including 42' HD Flat-screened TV, 3 Pools, sauna, spa & steam room, massage facilities,game room, miniature golf, tennis, golf, ski slope, fitness Center, Community Activities and Planned Trips Available plus camp for the kids! The property was in great condition. This is the second time we have stayed here in the past 5 months. Our entire family enjoyed the coziness and the convenience of the location. You can not make a better choice for your trip. Beautiful home, well located, with all the comforts of home. close to all amenities. 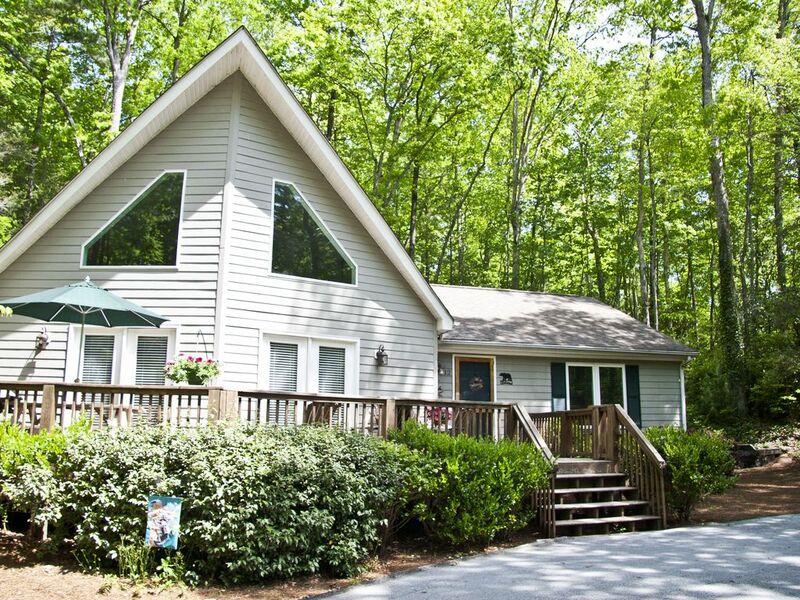 It sleeps 8 comfortably in its 4 bedrooms, 3 bathrooms. The wooded area around it is just beautiful I am certain any time of the year. I am so glad you and our family enjoyed our mountain home for the holidays and hope you will come again as the mountains is gorgeous and cool most anytime of the year! We like to have all the luxuries that a top-rated hotel would have for you. Many blessing to you and hope to see you back in 2019! Lovely home close to all the fun. Super clean and comfortable home within the resort area. Kitchen was well equipped and really enjoyed the gas fireplace. Will stay again on our next trip. Thank you so much and I am so glad you enjoyed our mountain home and the area as much as we have. Happy Holidays to you and your family! So glad you enjoyed our mountain home and the area as much as we do and hope you will come back and enjoy it again Spring Summer, Fall or Winter. You will also be eligible for a 10% discount for rebooking. Thank you so much! Excellent resort area, children and grandchildren had plenty to do. First time we ever rented a home from someone and my wife was thrilled with the cleanliness and overall appearance. What a little gem in a NC. This town and offerings are second to none for this area. Golf, Fishing, Hiking, Biking and scenery are just a few of the many things to do. So glad you enjoyed my mountain home and area and hope you will book again soon. There are over 250 waterfalls in Jackson County alone. Gorgeous hiking trails, ski mountain on-site; Spring & Fall festivals and local craft shows, lots of shopping, antiques, and great dining restaurants! Rental includes all amenities of Sapphire Resort except there is a nominal charge for golf and boat rentals. Sapphire Resort controls & issues all ID cards. All persons over the age of 14 requesting renter/lease cards will be charged $2.00 per day per person for a minimum of 3 days and a maximum of 6 months. Renters will need to present proof of ID to obtain these cards. Cleaning fee of $250 is deducted from $500 security deposit. WITH A 3-NIGHT RENTAL, YOU RECEIVE THE 4TH NIGHT FREE! SPECIAL WINTER WEEKEND RATE IS $950 AND 4TH NIGHT FREE! Holiday Weekends or Weeks are exempt.There is no refund once deposit is made UNLESS owner is able to re-rent, then 100% may be refundable. You must list a Pet on the site if you would like to bring your pet as the resort requires that all pets be registered that will be occupying the property and a non-refundable pet deposit is required.